In addition to the other AR happenings at Mobile World Congress 2010, Metaio will be featured at “Creation Day” with Sony Ericsson. They’ll be showing off their latest feature tracking technology on a new Sony Ericsson device. Thanks Jan from Augmented Blog for the update. He promises some exciting releases and a movie after MWC2010 has concluded. And once again, we won’t be able to attend – so if you’re there – keep us updated about your experience. Over the last 2 years we have seen growing interest in Augmented Reality in various events – panels, dev camps, meetups – and many more. Due to growing demand for knowledge and expertise in augmented reality (AR), a group of AR industry insiders, backed by the AR Consortium have put together the first commercial event dedicated to advance the business of augmented reality. …previously touted here as the “World’s best Augmented Reality event”? Well, ISMAR is still the best AR event for the scientific community. If you want to learn about (or present) the latest advancements in AR research – you should be in Seoul this October for ISMAR 2010. However, for the rest of us, who wish to take advantage of AR in practice, in the commercial world, and build a business around it – there was a gaping hole. Meet the Augmented Reality Event. For established and start up AR companies (such as Total Immersion, Metaio, Acrossair, Ogmento, Circ.us, Mobilizy, Layar, Zugara, Neogence, whurleyvision, Chaotic Moon Studios, and many more) – are2010 is a stage to showcase their products and services; a venue to form partnerships, learn about latest innovations, and most importantly speak with clients. Bruno Uzzan, CEO of Total Immersion will wow the audience with a cutting edge augmented reality show; Peter Meier, CTO of Metaio, will speak about his companies latest products. Early stage startups and individual developers will receive guidance from Cole Van Nice (Chart Venture Partners) for how to build a successful company in the AR space, including raising funding (from VCs that actually invest in AR), licensing technology and IP, legal aspects, forging partnerships, etc. Christine Perey will speak about the scope of the mobile AR industry today and it’s growth trajectory. For Mobile, Hardware, and Platform companies (such as Vuzix, Nokia, Qualcomm, Intel, QderoPateo, Microsoft, Google, Apple etc.) are2010 consists of a captive audience to launch and showcase their latest devices, processors, AR glasses, sensors, etc. The best collective minds of the AR commercial world will be onsite to articulate the market demand characteristics and help influence the design of future hardware. For clients and agencies in entertainment, media, publishing, education, healthcare, government, tourism, and many more – are2010 offers everything you need to know about AR: how to leverage augmented reality to advance your brand, attract and keep your customers, and how to build successful campaigns and products that will delight users, including postmortems of landmark augmented reality projects. Are you an AR Enthusiast? If so, you’re going to feel like a kid in a candy store at ARE, with a soon-to-be unforgettable keynote by Bruce Sterling, demo gallery, exhibitors from leading companies, artists installations from AR artists such as Eric Gradman and Helen Papagiannis, and many more surprises. If you are into Augmented Reality – are2010 is the one event you should attend this year. Want to join the event? Early registration is now open! ISMAR 2009 is starting Today. Woo-hoo! Looks like a true conference. Beyond the strong presence of researchers – many start ups, game developers, artists, press. The augmented reality industry is forming in front of our eyes. Multiple interesting innovation workshops are on the agenda for today. I am joining the Mobile Magic Wand workshop. Christine Perey kicks off the workshop with a dry definition of what Mobile AR: is a catch all Mobile AR apps, services, hardware, content for consumers, professionals, prosumers, both indoor and outdoor. These are early adopters, avid users of social networks, mostly located in western Europe, north America and south east Asia. Who’s in the audience? Mobile network operators and mostly content and application developers. Dirk from Layar confirms they have shared 1000 developers keys. This is starting to look like a solid community. Peter Meier CTO of Metaio is first on stage (self described Dinozaurs in the AR space) starting with an introduction to Junaio: take pictures of locations and post in 3D in a physical location that are stored on a Metaio server – so that both mobile and home users could enjoy. Anyone can create Junaio enabled games using web APIs. It’s for programmers and non-programmers, it will includs marker tracking and markerless tracking. Markus Tripp from Mobilizy, joined the founder Philipp in the very early days of this start up (currently 10 employees). The SDK is free for developers (developers have to pay when they publish an app based on Wikitude). Nokia has been in the space for a while and the underlying OS Symbian is being open sourced. N97 is a great device for augmented reality scenarios. But there are many moe cheaper phones that can do AR. Last on the roundup is Chetan Damani from AcrossAir. Established 2008, a free AR browser (planned to be released in December.) not as advanced as some of the other players so far. Across Air browser will be completely 3D with angles and dimension. Keeping a simple user interface. The use case: learning entertainment app. The proposal is about Dinosaurs AR with 3D animation. Shows a video of 3D dinosaurs walking around you in a park! Chetan wraps up with success factors to consider for the app such as keep the UI simple, take advantage of the features, keep data dynamic (web access), and make sure the location is valuable to the app – and don’t forget to promote your feed and notify users. How much can you make out of it: you could charge $1.99 to ativate feed and rev share for advertising network, affiliate programs. After a quick break “fluid adjustments” Jay Wright, responsible for business development at Qualcomm, comes on stage to talk about the vision of Augmented Reality for 2012. Exciting. Jay is responsible for the commercialization of AR at Qualcomm. That’s music to my ears! Jay sees the future of mobile AR as moving from a compass based (Wikitude, Layar) to vision-based approaches. Some of the existing barriers for mobile AR such as limited computational power and power consumption will have to be addressed by phone manufacturers. : more MIPS (like with SnapDragon that offers 1GHz! ), programmable GPUs, multimedia accelerations, and integrated chipsets (helps optimize power consumptions) , new classes of sensors with dedicated processors, new displays with higher resolution that work better in sunlight (OLED). Jay even hints at including advance gesture recognition into hardware. Head-mounted displays – we are all waiting for see-thru displays which are aparently very difficult to achieve with today’s technology, and we need to think about new interactive and intuitive UI paradygms. Location services accuracy will improve by fusing multiple location engines. Batter life – AR is a very hungry for battery power, which are only advancing 8% a year. Manufacturers are looking at new simpler ways to charge devices (by dropping the wires). Cameras – we’ll need wider field of view,fast and efficient programmatic retrieval of image frames, moving into HD etc. Additional considerations for the future: operating systems will introduce AR specific capabilities, ubquitious WWAN broadband, smartphone peripherals, peer to peer capabilities (e.g. for games), and location aids. Jay wraps up with a quick look out of AR platforms: they will consist (like in many instances in the past) of player and content, supported by authoring tools. How will the total industry revenue in 2012 will be broken up? AR developers for technologies and tools, corporations spending on products and services, and eventually end users will pay for premium apps and services. Content for AR browsers will include public sources, premium content authored by agencies, and crowd sourcing. To get a sense of the potential – in the last few weeks Tobias tracked about 3000-5000 twits a day about Augmented Reality. Business models that could work for AR 2.0 (similar to web 2.0): ads, affiliate, pay per view for premium content. Ways to publish content: stand alone apps (not scalable), AR browsers (is now very popular), AR widgets (more modular). Dieter picks up the discussion and dives into user created content for social augmented reality (building on the success of web 2.0): bottom up process of rating and tagging information by the crowds. AR infrastructure will consist of big content providers and personal content providers. Authoring : today is mostly happening on the desktop. In situ authoring will become more prevalent and efficient at capturing real time, location-specific information. Dieter ends with a tongue in cheek: Google cars will not go into your bed room (to create street view like images) – so there will be a need for individuals to capture content indoors. Nobody leaves…is nobody hungry or is Mark that good? How is the AR experience affected with AR 2.0? How do you deal with thousands of twits in your area? The answer is of course through information filtering. Designing for individuals is very different than designing for crowds. Mentioning an example of Carlo Ratti from MIT – which tracks location of people over a city scale. Stay tuned for exciting breakout sessions after lunch. It’s getting late in the second day of ISMAR ’08 and things are heating up…the current session is about my favorite topic: Augmented Reality applications. Unfortunately, I missed the first talk (had a brilliant interview with Mark Bullinghurst) by Raphael Grasset about the Design of a Mixed-Reality Book: Is It Still a Real Book? I will do my best to catch up. Next, Tsutomu Miyashita and Peter Meier (Metaio) are on stage to present an exciting project that games alfresco covered in our Museum roundup: An Augmented Reality Museum Guide a result of a partnership between Louvre-DNP Museum lab and Metaio. Miyashita introduces the project and describes the two main principles of this application are Works appreciation and guidance. 600 people experienced the “work appreciation” and 300 people the guidance application. The visitors responses ranged from “what’s going on?” to “this is amazing!”. In web terms, the AR application created a higher level of “stickiness”. Users came back to see the art work and many took pictures of the exhibits. The computer graphics definitely captured the attention of users. It especially appealed to young visitors. In conclusion, in this broad exposure of augmented reality to a wide audience, the reaction was mostly positive. it was a “good” surprise from the new experience. Because this technology is so new to visitors, there is a need to keep making it more and more intuitive. Augmented reality is a great too for Training. Case in point: Anesthesia education – keeping the patient asleep through anesthetic substance. How cold we use AR to help educate the students on this task? After action review is used in the military for ages: discussing after performing a task what happened? how did I do? what can I do better? AR can provide two functions: review a fault test + provide directed instruction repetition. With playback controls on a magic lens, the student can review her own actions, see the expert actions in the same situation, while viewing extra information about how the machine works (e.g. flow of liquids in tubes) – which is essentially real time abstract simulation of the machine. The result of a study with testers showed that users prefer Expert Tutorial Mode which collocates expert log with realtime interaction. Educators, on the other hand, can Identify trends in the class and modify the course accordingly. Using “Gaze mapping” the educator can see where many students are pointing their magic lens and unearth an issue that requires a different teaching method. In addition, educators can see statistics of student interactions. Did students prefer the “magic lens” or a desktop? Desktop was good for personal review (afterward) which the Magic lens was better for external review. The conclusion is that an after action review using AR works. Plus it’s a novel assessment tool for educators. Design of a Mixed-Reality Book: Is It Still a Real Book? “Enjoy the weather” uttered sarcastically a kindhearted British witch (aka air hostess) while we were leaving the aircraft; surprisingly – we did in the first day. We were then promised this is accidental and surely the last day of summer. Splendid. Venice, Italy? 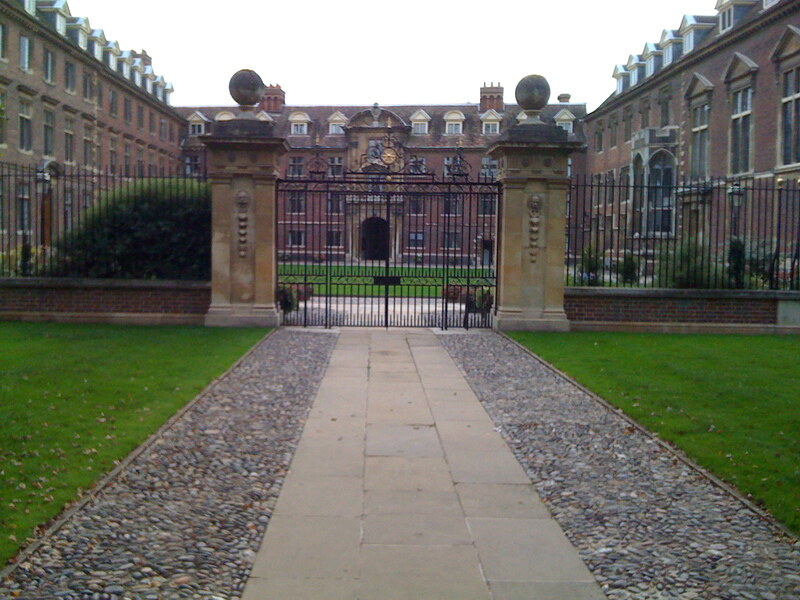 nope, Cambridge, UK! 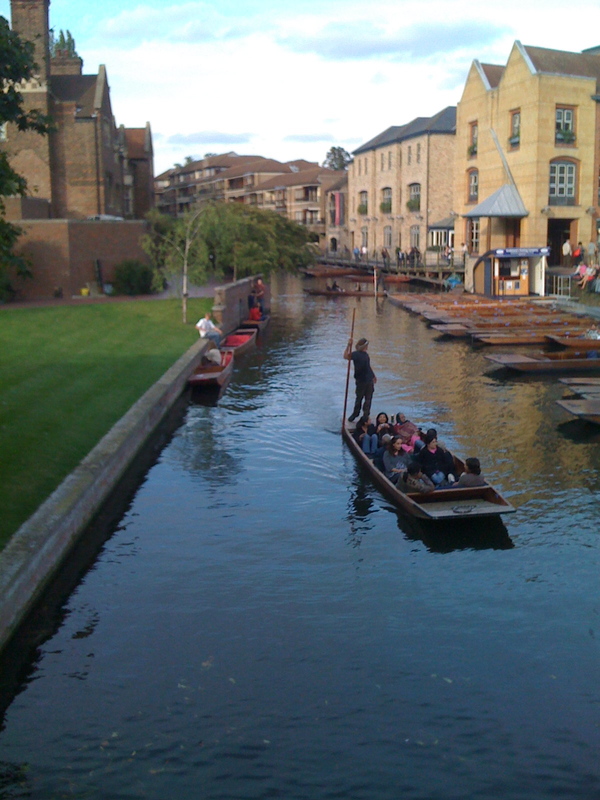 I have landed in Cambridge, UK (where people go to augment their reality) and all I ever heard about it – is true: British meadow green, majestic 600 year old buildings, cosmopolitan young folks, fish cakes…a combination that gives this university city its unique aura; a great setting for the event starting tomorrow – reality only better, at ISMAR ’08. For those who couldn’t make it, stay tuned for a live coverage of ISMAR ’08, the world’s best augmented reality event. — overing topics such as: Industrial augmented reality, hand-held augmented reality, displays, user studies, applications, layouts, demos, state-of-the-art AR, and don’t miss the highly anticipated tracking competition. Welcome all speakers and attendees to the event, and don’t forget: look right first! If you are at the event (or not) and want to chat, share thoughts, or ask questions – leave a comment here or send a message on facebook.